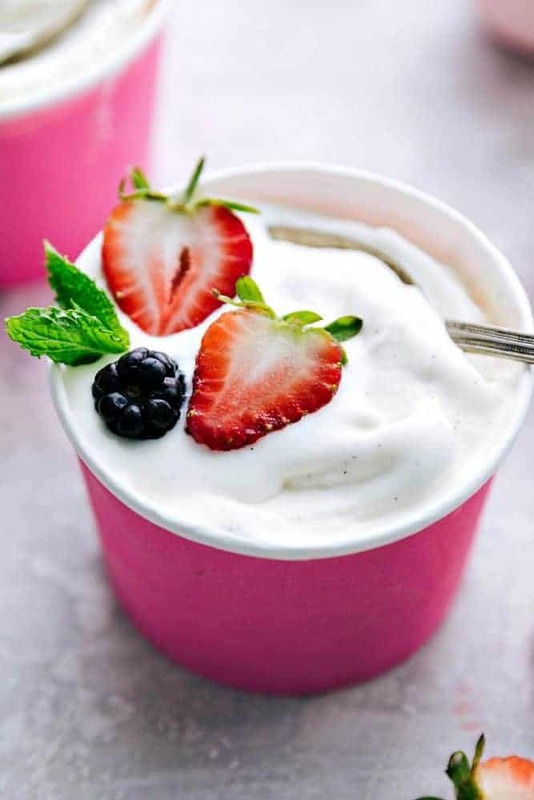 This vanilla soft serve frozen yogurt is delicious and perfect for the hot summer days! Everyone goes crazy for it! Hi everyone! Chelsea back from Chelsea’s Messy Apron! How is your summer going so far?! Ours has been a HOT one which definitely calls for lots of good frozen treats! Namely this vanilla soft serve We’re obsessed with it and can’t get it enough this summer! How do you make vanilla soft serve? This vanilla soft serve is SO easy to make! What ingredients are in vanilla soft serve? With so few ingredients, you’ll want to make sure you have the best ingredients for optimal taste. Get a good yogurt that you know you’ll love. 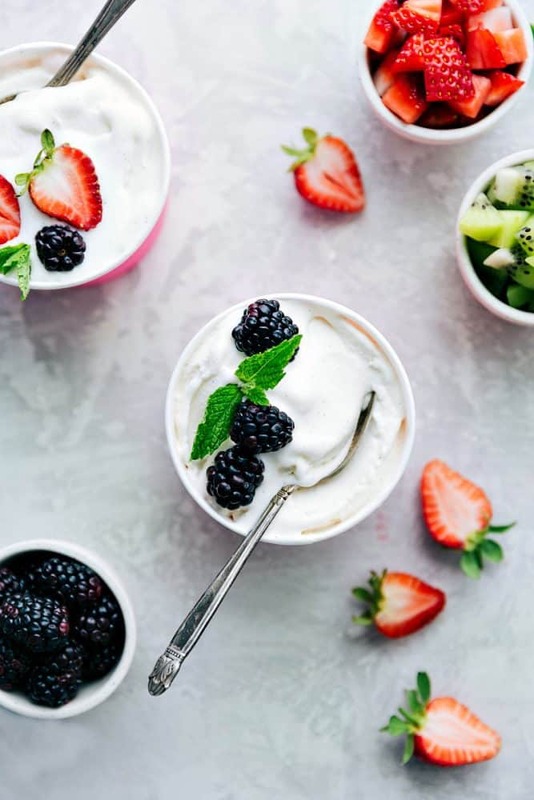 I recommend a high quality full-fat Greek vanilla yogurt because it will make for a creamier and more flavorful yogurt. I also would stick with the heavy whipping cream to ensure that this yogurt sets up well. And of course, the more fruit chunks to stir in the yogurt, the better. Or do chopped candy bars, cereal, and fruity treats — you’ll be amazed how much it tastes like an authentic fro-yo place! In a large blender, mix together the first four ingredients. Blend until completely combined. (If your blender isn’t large enough, do this in batches). 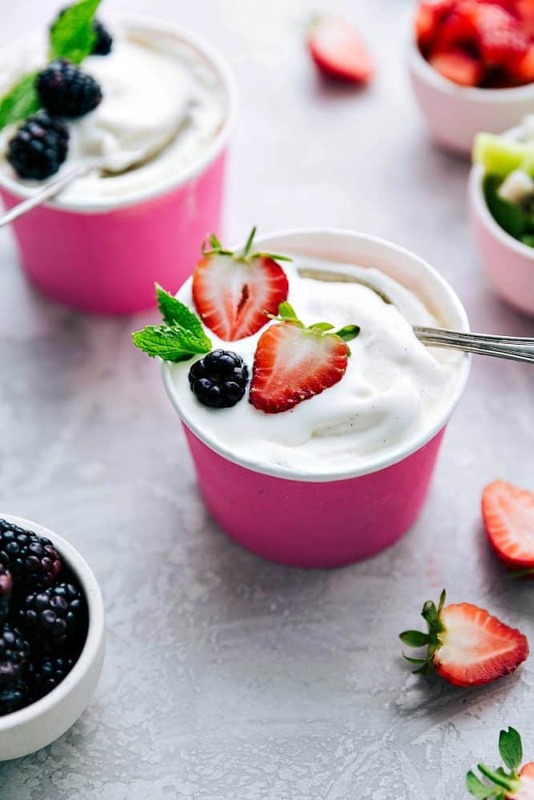 Pour the mixture into a prepared ice cream maker and follow ice cream maker directions to chill the yogurt. Mix in fresh fruit, chopped candy, cereal, etc. into the frozen yogurt.